I like cooking, maybe because I love eating. But also when you cook you may be (or may be not) creating something special. Therein lies the magic. With everything I'm try to feel the same, sometime is a course, sometime a new project, I always have something in the kitchen. 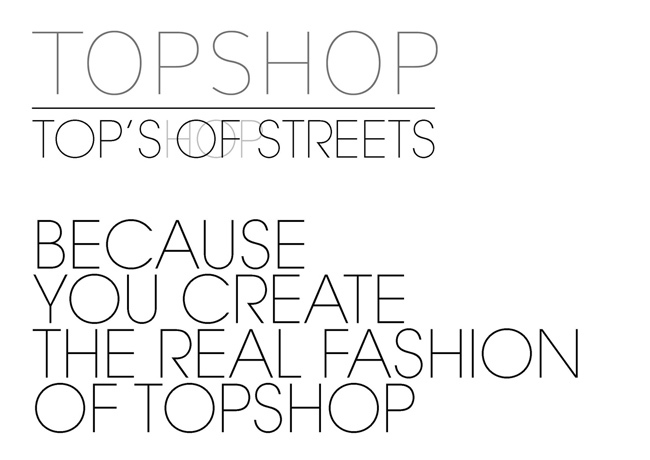 One-Day-Project to create a relaunch campaign for TopShop. The food was good, a little below you can see the result as a complete presentation. This is a short project for a course. Thank you very much Giulio Mazzarini for your classes. I have to thank my colleague, Paola Bossini all her contribution. And apologize for the use of the amazing images of 'The Sartorialist', and the use of the great images from the sales campaign to 'Harvey Nichols' by DDB London. Sorry, but we had no photographer or time to overcome your styling. Project carried out in the course 'Documentary Self-Shooting & Editing Tapeless' University of the Arts London. Not bad for three days of course, all mixed between the classes, shooting and editing. Thank you very much Anton Califano for your classes. Thanks a lot to Lucie Beecham, with her this video has been possible, and Antonia Ball that helped us both.